Dreamhost prides itself on being an award-winning WordPress host. Considering that Dreamhost hosts over 1.5 million sites for 400,000+ members and they’re one of only four web hosts that WordPress itself endorses, they have good reason to be proud. Their unique relationship with WordPress, thanks to over 750,000 one-click installations, should put Dreamhost on your hosting short list if you’re starting a small site. If you want to move beyond the blogging, Dreamhost has features that will appeal to developers. They can launch cloud servers in 30 seconds and they support apps like Ruby on Rails, MongoDB, and Redis. Dreamhost is also an OpenStack Foundation Gold Member. Their commitment to Open Source comes in the form of financial backing, coding contributions, and community leadership. Entrepreneurs and small businesses can’t afford to be offline for long so it’s worth highlighting Dreamhost’s unique 100% uptime guarantee. For every hour that your website is offline, they’ll credit you a day’s hosting service. Since Dreamhost is willing to spend its own money on downed sites, it’s a good bet that yours will stay online. Dreamhost was founded in 1997 by Sage Weil, Michael Rodriguez, Josh Jones and Dallas Bethune, four friends who were undergraduates from Harvey Mudd College in California. Their company name, New Dream Network, LLC, was officially registered in 1997 and that’s when they began hosting websites. This group of friends had a love of open-source software, technology and a powerful desire to help online people band together. They built Dreamhost on open-source technology and made a strong commitment to helping their customers. Currently, Dreamhost, CEO is Simon Anderson, hosts over 1.5 million websites and has more than 400,000 members in 100+ countries around the world. This company has been voted as the best hosting provider for the second year in a row by PC Magazine. Try DreamHost. Get started now. Founded by Sage Weil in 1997. What are the Main DreamHost Features? What Hosting Types & Plans Does DreamHost Offer? DreamHost offers a wide range of hosting solutions tailored for e-commerce, WordPress, and other small businesses. Shared hosting is the most affordable hosting option for most small businesses that don’t receive high levels of traffic. Shared hosting means your website is stored on a server along with other websites. These plans are suitable for blogs, database driven sites, personal and business sites and portfolios. You get one free domain name and you can host unlimited domain names. If you have a larger business, use e-commerce, are a designer or a developer, then VPS might be ideal for your needs. Virtual Private Servers give the advantages of a dedicated server without the higher price tag. Up to 8 GB RAM. 30 GB- 240 GB SSD storage. Have a large business or get tons of traffic? You may need a dedicated server. It can be fully managed for you and is ideal for apps and sites with a lot of traffic as well as resellers and agencies. This is the most expensive type of hosting. 4 GB- 64 GB RAM. Up to 2 TB storage. Full shell and root access. Dreamhost is endorsed by WordPress. WordPress is one of the most popular website builders on the web. If your small business is using WordPress, then DreamHost provides specific plans just for you. You can have your site fully optimized for WordPress and blogs. Automatic installation of WordPress and updates to the core. Able to use any WordPress plugin or theme. PHP 5.5 with OPcache & Optional HHVM. Dreamhost’s Cloud hosting is called DreamCloud. DreamCloud is comprised of DreamCompute (public cloud computing service) and DreamObjects (scalable storage solution). DreamCompute is much better than VPS because you can deploy and customize your cloud servers. With DreamObjects, you’ll have a completely scalable storage service for all your data and you can access it any time. Try DreamHost. 97-day money-back guarantee. Although support is offered 24/7/365, you can’t actually ring the DreamHost support team. However, for a fee, they offer to ring you. Live chat (mainly available when there are not many support staff handling the tickets). Chat is a permanent option for customers who pay a monthly call back fee. Many of the team are WordPress experts for people needing that specific knowledge. DreamHost offers one of the longest money back guarantees in the hosting industry, it’s 97 days which is very generous. If you cancel within 97 days of joining, you get a refund. However, this comes with a couple of caveats; it only applies to shared hosting and you must have bought your hosting with a credit card or used Google Checkout. Starting for just $10.9 a month, you can choose the monthly billing option with DreamHost. This allows you to cancel at any time (with no additional fees!) and provides the same great features as the annual plans. If you are not able to make a large payment for the annual plans or if you aren’t sure how long you will need your site, this is a great option that not all web hosts offer. Keep in mind, the per-month fee is higher, but it may be worth it if you need the flexibility of monthly billing. If you are looking to run an e-commerce store on DreamHost, you will be delighted to see a number of useful features aimed at keeping your store fast and secure. “Remixer” — an easy-to-use website building tool. No knowledge of code is required. Video: Need a website for your small business? DreamHost offers the “Remixer” site builder, an easy-to-use website creation tool that requires no experience. Chef Trish Myers used it to create her site. Are there Any Bonuses or Extras? Because DreamHost has won the best hosting site twice in a row, the company is offering a 30% discount on some plans. 97-day money-back guarantee. $100 worth of credits for Google Adwords. The bottom line: is DreamHost any good? Here’s a summary. Unlimited data storage and bandwidth. Unlimited sites can be hosted on the same account. Free Domain with Whois Privacy. Supports most scripts including CGI, Perl, PHP5, and Python. Some hosting features within the dashboard cost extra. No website builder is included. Although it’s free on shared plans, the “Remixer” website builder must be added as a separate service on any other hosting plan. Call-backs from support staff cost extra. Costs aren’t as low as many competitors. The control panel can be hard to navigate due to having too many options. Dreamhost’s site doesn’t have all the answers that are freely available on the websites of other hosting providers. The Dreamhost website doesn’t contain enough information to help you make an educated decision as to whether you’ll use their services. It’s a wise idea to read reviews to get a well-rounded opinion of this hosting provider that does things quite differently to a lot of its competitors. What payment options does DreamHost offer? DreamHost accepts a variety of payment options through your panel: PayPal, Credit/Debit Card (Visa, MasterCard, American Express, Discover, and Diners Club), Checking Account, Check or Money Order, Gift Certificate. How can I contact DreamHost? There are several ways to contact DreamHost if you need support. Email (support tickets), phone (callbacks available for a nominal monthly fee) and live chat. What languages does Bluehost support speak? Their customer service is only provided in English. Where are DreamHost servers located? Their headquarters and data center is located in Los Angeles, California, in the United States. What are the best Bluehost alternatives? Bluehost is a good and reputable web hosting provider, however, the best Bluehost alternatives are; InMotion Hosting, DreamHost, HostGator and SiteGround. What is DreamHost cheapest hosting plan? Their cheapest plan is 2.59. DreamHost offers a 97 days money guarantee. In other words. You get a refund if you decide to cancel your hosting with DreamHost within the first 97 days. Can I register domains with DreamHost? DreamHost lets you register domain names. Whois privacy is also available for a yearly cost. You also get one free domain name registration for one year with all of their hosting plans. How do I install WordPress on DreamHost? DreamHost offers managed WordPress hosting, called DreamPress. However, WP can be easily installed on any hosting plan using their built-in WordPress “one-click installation” which can be accessed from within your control panel. Which DreamHost plan is best for WordPress? 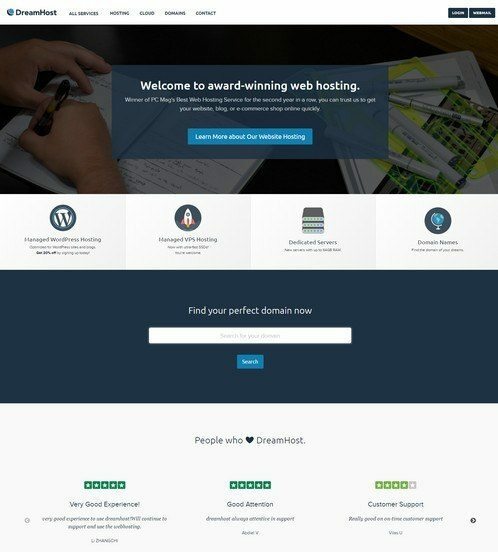 DreamHost offers tailored made WP hosting, their managed platform is made for hosting WordPress websites. DreamPress 2 is optimized for WordPress sites and blogs. Try DreamHost. 97-day money-back guarantee. It’s risk-free. Dreamhost has a range of hosting solutions to choose from; shared, VPS and dedicated servers, to WordPress and cloud hosting. Here below is an overview of their plans and current price list. For latest and most up to date prices visit DreamHost’s website. DreamHost is proudly hosting over 1,500,000 websites since 1997. They offer shared web hosting with plenty of power and unlimited everything! DreamHost’s shared web hosting gives you a free domain name, fast SSD storage and email hosting for your website. They’re so confident you’ll love their hosting service that if you cancel within the first 97 days, they will return all your money. Use this DreamHost coupon and get 40% off the original price and a free domain name is included as well! Get our DreamHost deal Use this DreamHost coupon and get 40% off the original price and you get a free domain. We monitor tweets about DreamHost and apply sentiment analysis to classify tweets as positive or negative. This allows us to output an approval rating score, which is based on real people, positive and negative, opinions about DreamHost on Twitter. DreamHost approval rating score is 76%. This is based on a total of 1902 tweets that mention DreamHost on Twitter. There are 1449 mentions that share a positive sentiment and 453 mentions that express a negative sentiment. Find out more about how it works. I regret buying my @africandomain from @LexsynergyLtd so much, decided to change the domain to a .com & register with @DreamHost & be happy. Thank you @DreamHost! Your software and customer service are great. I built a website in a few hours with no prior experience. @DreamHost omg, you guys saved my life tonight. My website https://t.co/gXGk9NWuqU is a finalist for @DreamHost Dreamiest Homepage! 😀 https://t.co/bLTKRRmLEk to vote for me! @DreamHost Please advise status of ticket #7585494 which was moved, not closed. This is getting urgent. I don't like being brushed aside. The customer support at @dreamhost is a lifesaver! Thank you guys, and happy holidays! Try DreamHost. 97-day money-back guarantee. Get started now. Next: FlyWheel Hosting Review: Delightful Managed WP Hosting. We Test It For You.